Appam is a Popular South Indian Breakfast recipe, especially in Kerala. I tried Appam using Thinai rice, you can replace thinai with any other millets rice such as little millet(saamai), barnyard millet(kuthiraivali) or kodo Millet(Varagu). 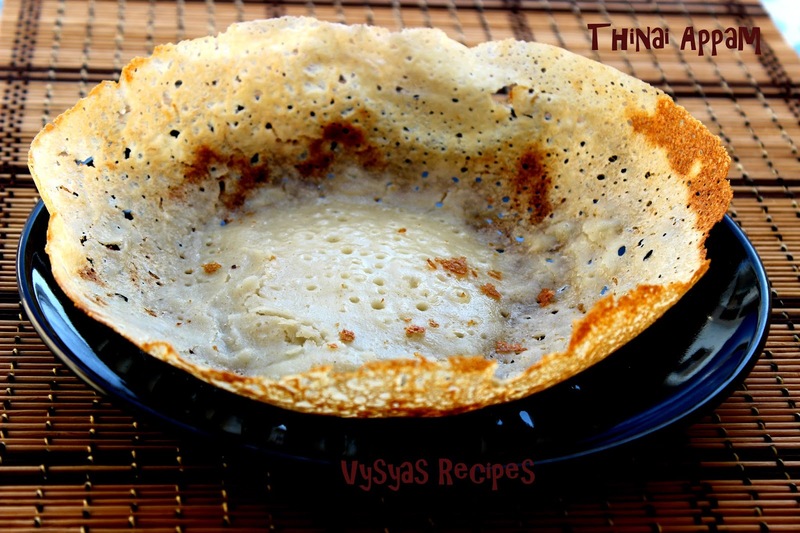 This is a healthy breakfast recipe, and also not requires much oil.Appam is soft in centre and lacy at edges. Appam is often served with Coconut chutney or Coconut Milk. Monthly twice we make appam at our home. Now we learn the procedure to make Millets appam without Cooking soda & yeast. Thinai rice/korra rice - 1 cup. urad dal - 1/3 cup. Soak Raw rice,Idli rice,Thinai Rice,urad dal, Sago and Methi seeds for 4 -5 hrs or overnight. Grind into a smooth batter with needed water. Add salt, mix well and keep it aside. Allow it to ferment for overnight or 10 -12 hours.Let the consistency of batter be moderate, i.e little thinner than dosa batter consistency as shown in the picture. Take a Heavy bottomed kadai or Appam Pan with handles,smear 1 tsp of oil into a pan, then wipe it with a cloth.leave it as such for half an hour. if you are using Non stick kadai, skip this step. Heat the Pan, keep the flame to low.Add the ladle of batter to the centre. Hold the handles of a Pan, and rotate the pan in a cirular motion, so that the batter automatically spreads all over the Pan, and the remaining batter comes to the centre.cover it with a lid. Cook in moderate flame.once the Appam is cooked, and turns brown at the edges, remove the Appam by lifting it in your hand. Repeat the same procedure for remaining Appam. It is not necessary to smear oil, before making each Appam. if you feel kadai is dry, just smear a tsp of oil, and then wipe it with a cloth. Appam's are served with Coconut Milk, Coconut Chutney,vegetable korma or kadalai curry. Adding sago gives,softness to Appam. I learnt this tip from my family friend, Selvi Aunty. Before making Appam, make sure that Appam Pan is coated with oil.if you are using nonstick kadai, just skip this step. if you feel kadai is dry, while making Appams, just smear a tsp of oil and wipe it with a cloth. Consistency of batter is also an important criteria, while making Appam.By practice you get Good consistency. Interesting. I see sago as one of the ingredients. Turned out fabulous. My fav as well. These look super delicious and soft! This is healthy, looks so nice and soft in the middle. 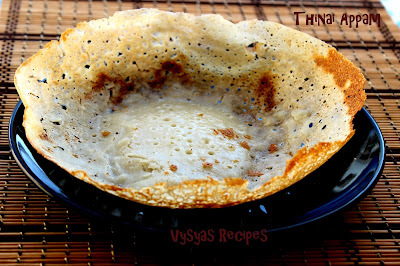 a different & delicious appam.......using sago is an interesting idea.